Today the reconstituted math department graduates five times as many majors… a third of them women. More than half of all Williams undergraduates complete multivariable calculus [and introductory statistics]. Most impressive of all, 12 percent of the College’s graduates major in mathematics at a time when… the national average hovers around 1 percent. In other words, the department did not become popular by chance or by working harder at it than other departments. Rather, it made a decision to become a popular department rather than a selective department. The whole design of the curriculum and staffing is different when popularity rather than selectivity is your goal. Is this related to Dweck’s growth mindset? Does the belief that all students can enjoy and pursue math make it more likely that they will? The next question is: why have so many departments not made this decision, choosing instead to continue to prioritize selectivity? Shouldn’t everyone also have a chance to enjoy physics and anthropology and comparative literature? Are academicians too focused on being “serious”? Do they take the fixed mindset, believing that only people with the right “talent” and “drive” can succeed in their field of study? Who do you need in order to make outstanding educational software? What pieces do you need to bring together? Once the disruption in education takes hold, software with all of these pieces will prove very popular. This demo video by Bret Victor is a perfect example of an innovative “direct manipulation 2.0” interface. If I give my presentation again about scientific direct manipulation, I will certainly include it. Interactive Exploration of a Dynamical System from Bret Victor on Vimeo. One of the best talks at CHI this year was by Chris Harrison of Carnegie Mellon, who presented work on what he calls “kineticons” — applying motion to icons and GUI elements of all scales. This is not animated icons per se, but motion applied to static icons. He came up with 39 kineticon motions and then asked 200 Amazon Mechanical Turk workers what they thought the motions meant. Among the interesting results was that “blowing in the wind” was a better indicator of movability than the iPhone springboard’s “jiggle” motion. Apple has been a pioneer in using this type of motion to convey meaning, but Chris neatly shows how many more possibilities there are. Three-photo composite of the view from the Vancouver Convention Centre, host of CHI 2011. Direct manipulation depends on… rapid incremental reversible operations whose effect on the object of interest is immediately visible. This strategy can lead to user interfaces that are comprehensible, predictable and controllable. Direct manipulation interfaces are seen as more likely candidates to influence advanced user inter- faces than adaptive, autonomous, intelligent agents. User control and responsibility are highly desirable. That’s worth reading carefully and thoughtfully. Agent promoters believe that the computer can automatically ascertain the users’ intentions or take action based on a vague statements of goals. This author is skeptical that user intentions are so easily determined or that vague statements are usually effective. However, if users can specify what they want with comprehensible actions selected from a visual display, then they can more often and more rapidly accomplish their goals while preserving their sense of control and accomplishment. I completely agree with Shneiderman. I wonder if “agent promoters” today have progressed enough to offer solid counterarguments. I saw Bill’s random album art and wanted to join in the fun. (See instructions below.) 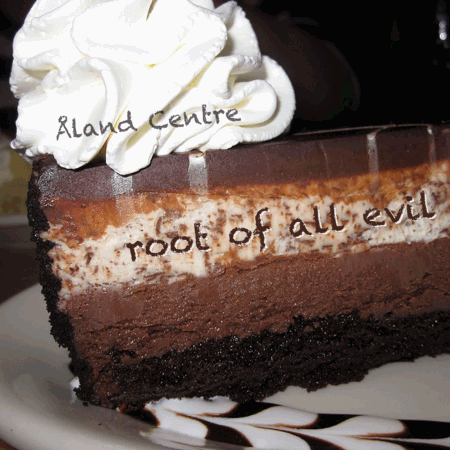 The result turned out to be kind of ironic, implying that cake is the root of all evil. It makes for an eye-catchingly contrarian album cover. 1 – http://en.wikipedia.org/wiki/Special:Random – The first random Wikipedia article that comes up is the name of your band. 2 – http://www.quotationspage.com/random.php3 – The last four or five words of the very LAST quote on the page is the title of your first album. 3 – http://www.flickr.com/explore/interesting/7days – The third picture in the top row, no matter what it is, is your album cover.